Chimney Design - How Do Chimneys Work? Proper chimney design is often misunderstood. With a handful of different styles and options, it's easy to get confused. Although a chimney is not the most glamorous component of your home, if you're going to heat with firewood it's definitely an important topic. Selecting the correct chimney size, layout and design is critical to how well it will function. If you're thinking about installing a wood stove or fireplace inside your home remember one thing........your wood stove or fireplace will only function as well as the chimney it's connected to. In fact, a majority of issues that homeowners have with their heating systems are often traced back to the chimney, not the heating system itself! 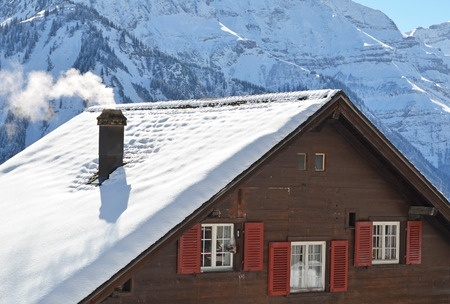 So, your heating system and chimney rely on each other for optimal performance. Since they work as a system, both need to be installed properly and maintained to ensure you don't have any issues in the future. Hot air rises because it's less dense than cold air. Chimneys take advantage of this basic principle. However, instead of removing hot air, a chimney's role is to remove hot gasses from the heating unit and expel them outside your home. As the gas rises up through the chimney it creates a difference in pressure known as draft. In other words, draft is simply the natural movement of gases up your chimney as your heating unit draws fresh air into the appliance. The hotter the gases are inside your chimney compared to the outside temperature, the stronger the draft will be. The height of your chimney can also effect draft. Chimney length and draft are related. A taller chimney will create a stronger draft. The volume of fresh air that enters the heating unit is called flow. A chimney that creates a strong draft will have a strong flow of fresh air entering the wood stove or fireplace, resulting in a hotter, cleaner fire. 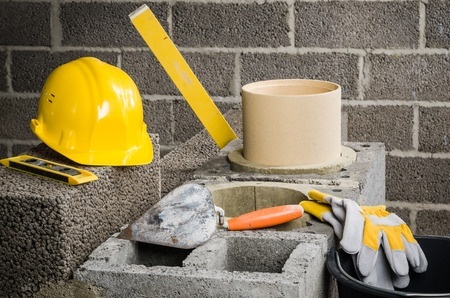 Understanding these basic principles is important when considering how to build a chimney. A solar chimney uses the same concept as a wood stove chimney, however, it uses the suns heat to create a draft. This causes the air in the chimney to rise and create ventilation for a home or commercial structure. If you're experiencing unwanted draft, unpleasant smells or noise when your fireplace is not in use, consider installing a chimney pillow. They're easy to set up and work really well. Unfortunately, even the best chimney designs can require occasional repair. Chimney damper repair is pretty common. A damper is a small door inside your chimney that is usually opened and closed by pulling a lever or chain. Dampers are used to prevent energy loss when you're not using your fireplace. They also prevent animals or rain and snow from entering your home. Since a damper is exposed to heat, ashes and soot from the fire, they will occasionally break or warp making them less efficient. Inefficient dampers should be replaced or repaired. Chimney flue repair is required when sections of your flue become damaged or cracked. The flue is the section inside your chimney that carries the gasses up the chimney where they are expelled outside. Flues are usually made of clay, brick or various types of metals. Have you ever noticed water inside your wood stove during the summer? Chances are this water is caused from condensation. 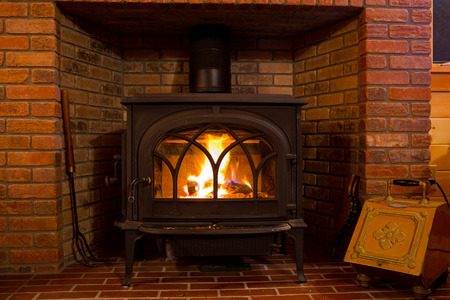 Read this article to learn how to prevent condensation in a wood stove. Installing a stainless steel chimney liner or an aluminum chimney liner is an easy way to repair a damaged chimney flue. They're relatively easy to install yourself and only require a few basic tools. A chimney crown sits on top of the chimney walls and helps shed water away from the entire chimney structure. Over time, chimney crown replacement may be necessary if the crown becomes cracked or damaged. A damaged crown could allow water to seep inside the chimney causing damage from the inside out. A chimney crown is different than a chimney cap or chimney cowl which prevents rain and debris from entering the chimney flue. Installing a copper chimney cap offers a decorative way to help protect your flue. If you have a wood framed chimney chances are you have a chimney chase cover over the top instead of a cement chimney crown. Over time the low grade metal chimney chase cover will rust and leak. Installing a stainless steel chimney chase cover is an easy way to prevent water damage. Learning how to clean your own chimney is a great way to save money and insure you're chimney is free from creosote buildup and debris. A lot of chimney cleaning supplies can be found at your local home improvement store or online. Read this article to learn more about chimney sweep brushes and how to use them. Recently, chimney cleaning logs have become very poplar offering a quick and easy way to clean your chimney. Do they work? Find out our opinion here. If you're not interested in cleaning your own chimney you can hire a professional. Depending on where you live, the cost for chimney cleaning can vary. We recommend hiring a CSIA certified chimney sweep for best results. If you need a general outline for chimney care, check out our chimney checklist! Chimney design, cleaning and maintenance are all important factors for creating a happy, well functioning chimney. Remember, a wood stove or fireplace is only as good as the chimney it's connected too!